There is nothing "lesser" on the Lesser Water boatman's mighty oars, which deliver efficient propulsion at racing standards. All parts are heavily reshaped to gain backward thrust and reduce forward friction in the water, at the cost of being less suited for walking or even crawling. 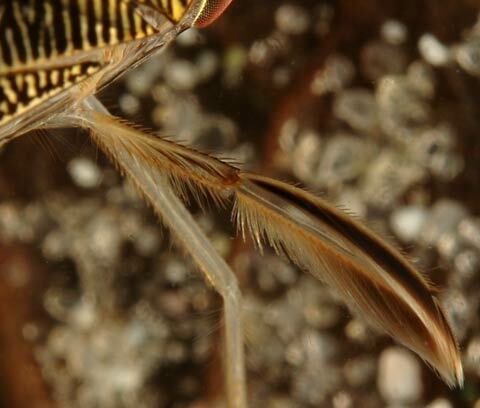 The joints of the foot(tarsus), clearly distinctive on most insects, have merged on this leg to form a wide and flat rowing paddle, which consists of two narrow jointed parts (not visible on the picture). Two wide fringes of hair turn this paddle in a kind of bird's feather, but with a difference: the fringes are able to flip backwards like a hinge, making the surface of the paddle smaller. When the Lesser Water Boatman makes a rowing stroke, the hairs are spread wide, making the active surface as large as possible and with that: maximum thrust. At the stroke back to the front the hairs flip backwards, making the surface, which now slows the animal down, minimal. The tibia also is wide and equipped with bendable hairs, giving extra thrust. There are rather big pegs on the limbs, so the legs may be used as a kind of steel brushes to remove scale and parasites. The feather shaped foot of the hind leg is also used to massage the breathing air bubble, more about this on the page on the way of life. All pictures on this site have been made by G.H. Visser (Almelo, Holland), unless otherwise mentioned. All rights remain with him. These photo's may not be used for other then strictly private uses. In case you want to use them for purposes including third parties, you MUST request permission, by e-mailing the author. I encourage especially those wanting to use the pictures for nature-expositions or other educative targets.